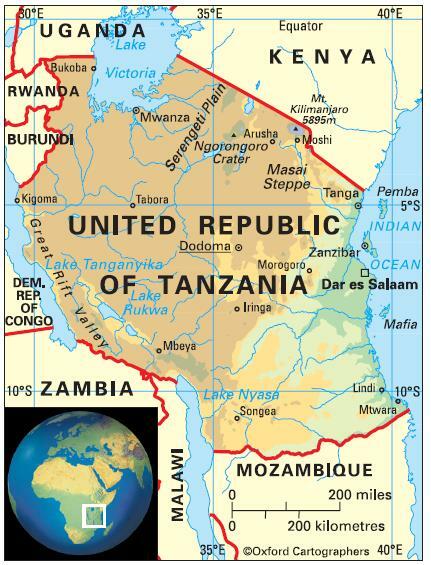 The United Republic of Tanzania borders the Indian Ocean to the east, and has land borders with eight countries: (anti-clockwise from the north) Kenya, Uganda, Rwanda, Burundi, the Democratic Republic of Congo (across Lake Tanganyika), Zambia, Malawi and Mozambique. The country includes Zanzibar (consisting of the main island Unguja, plus Pemba and other smaller islands). Varies with geographical zones: tropical on the coast, where it is hot and humid (rainy season March-May); semitemperate in the mountains (with the Short Rains in November-December and the Long Rains in February-May); and drier in the plateau region with considerable seasonal variations in temperature. The most significant environmental issues are drought, soil degradation, deforestation, desertification and destruction of coral reefs. 47,783,000 (2012); 27 per cent of people live in urban areas and seven per cent in urban agglomerations of more than a million people. The population growth rate stood at 2.9 per cent p.a. between the years of 1990 and 2012. In 2012 the birth rate was 40 per 1,000 people (48 in 1970) and life expectancy was 61 years (47 in 1970 and 51 in 1990). Most of the people are of Bantu origin, with some 120 ethnic groups on the mainland, none of which exceeds ten per cent of the population. The biggest group is the Sukuma; others include Nyamwezi, Maasai, Haya Gogo, Chagga, Nyaliyusa and Hehe. The population also includes Asian and expatriate minorities. The people of Zanzibar are of Bantu, Persian and Arab origin. Tanzania is classified as a low-income economy by the World Bank. Largest contribution to mortality: Communicable diseases, maternal, perinatal and nutritional conditions.